Today at work, I found myself heading out to a client’s site for a meeting. There were ten people around a large table in the conference room, about half of whom I’d met before and half of whom I had not. Seated to my right was a gentleman who I’d spoken to many times on the phone, but had never encountered face-to-face. “It’s an insulin pump,” I responded, nonchalantly. I agreed, and we both chucked at the notion of such an archaic piece of technology. It’s a scene that’s played out over and over in the life of a person’s diabetes life. 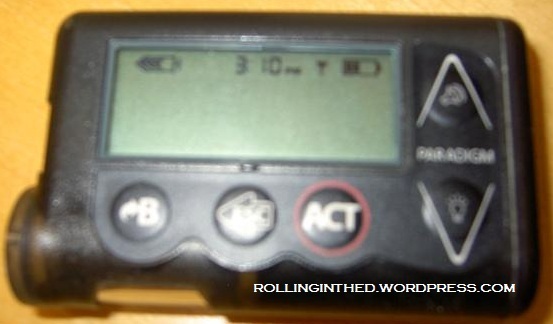 The pump-pager gaffe has become a common and recurring theme in the diabetes community. So why do I bring it up again? Well, in many interactions, particularly with folks we’ve never met, we tend to be defined by our professional or situational roles. She’s the Project Manger. He’s the Owner. That one over there is the Engineer. This one is the Contractor. And the guy across the table with the crooked tie and the bad comb-over is The One Who Pays the Bills (be nice to him!). Our responsibilities dictate how we deal with one another. We act according to each other’s inferred motives, and this inherently defines whether we see the others around the table are allies or adversaries. So, having that pump clipped to my side opens a small window to a part of me that continues to exist outside of the conference room. It tells others that I am not only the Electrical Design Manager, but that I am a living human being, and that I do not take life for granted. It tells others that I carry some pretty heavy responsibilities even after the work day ends. And I hope it tells others that I’m doing a darn good job at it, or at least that I’m putting forth an honest effort. Or that I’m capable of rising to a challenge that they, when they learn what the pump represents, believe they could never do. (Little do they know that, given no alternative, they can; but that’s a different lesson for a different time). What that insulin pump clipped not-so-discretely to my belt does is that it make me a person. It demotes the professional title to a secondary position and causes others to primarily see me as Scott, a pretty accomplished guy. What I do not want it to elicit is sympathy. If someone apologizes for calling attention to my medical condition I shrug it off as no big deal. I present myself with confidence, and I reject the notion of being considered “damaged goods.” I’m just as capable as anyone else, including (and especially) the person you thought I was before you learned of my diabetes. Because that’s what I believe of myself, and I don’t want others to think of me any differently. Yet, in a paradoxical sense I do. I want them to see me as someone more. I want them to be reminded that I have challenges and vulnerabilities and concerns that live outside of my corporate email account. Just as the other people sitting around that table do. Just as they, themselves, do. Only they don’t have an insulin pump to visibly demonstrate that their concerns are real. I do. And I display it proudly. It makes me a person. Posted on June 16, 2015, in Diabetes. Bookmark the permalink. 4 Comments. What a strong and positive role model you are for other people with diabetes. I hope my son can be like you in the future! Love this, Scott! What a great perspective to take. I am going to try to think of diabetes more in those terms from now on. I liked this post a lot! I’m constantly surprised how admiration follows my kid around because she’s out there doing what she needs to do. I really admire your attitude with your diabetes Scott! Thanks for sharing.